The agricultural industry’s biggest online farming event, 24 hours in Farming returns 9th August 2018 for the fourth year running. Starting at 5am Thursday August 9 and running until 5am, on August 10, anyone involved in the UK farming industry is urged to get involved by sharing posts, photos and videos of the work they are doing throughout the day on social media using hashtag #Farm24. Once again sponsored by Morrisons, the aim of the initiative is to demonstrate to consumers just how much passion and commitment goes into producing the food they eat and maintaining the great British countryside. The event has now built up a huge following, last year achieving a Twitter reach of more than 100 million, trending in the top five all day and attracting a number of high profile supporters. This year promises to be even bigger with consumers also being asked to join in for the first time by posting pictures of the British food they are eating on the day. 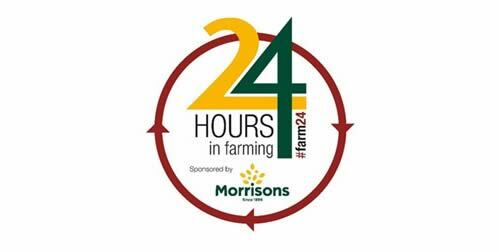 “Morrisons is pleased to sponsor 24 Hours in Farming. We understand it is important for British farmers and it is really important for Morrisons because we rely on British farming’s success. You can take part on: Twitter, Facebook, Instagram or Snapchat. Simply tag your post #Farm24 and we will pick it up and share it from our AgriBriefing accounts and online. We want to know about as much everyday farm work as possible, but also visits you may be hosting, meetings, trips, social gatherings, YFC meetings, even a night out if you like. Try to include photos and videos in your posts. Our aim is for #Farm24 to trend on social media all day, highlighting the work and care which goes into food production.